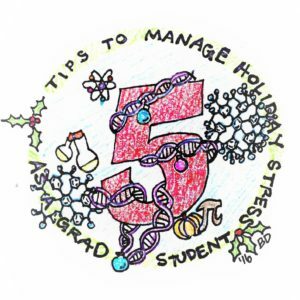 The holidays can be stressful for a number of reasons. Take a minute to count up your own stressors. As a graduate student or burgeoning academic, do any of these ring a bell? So, what can we do to handle the stress? 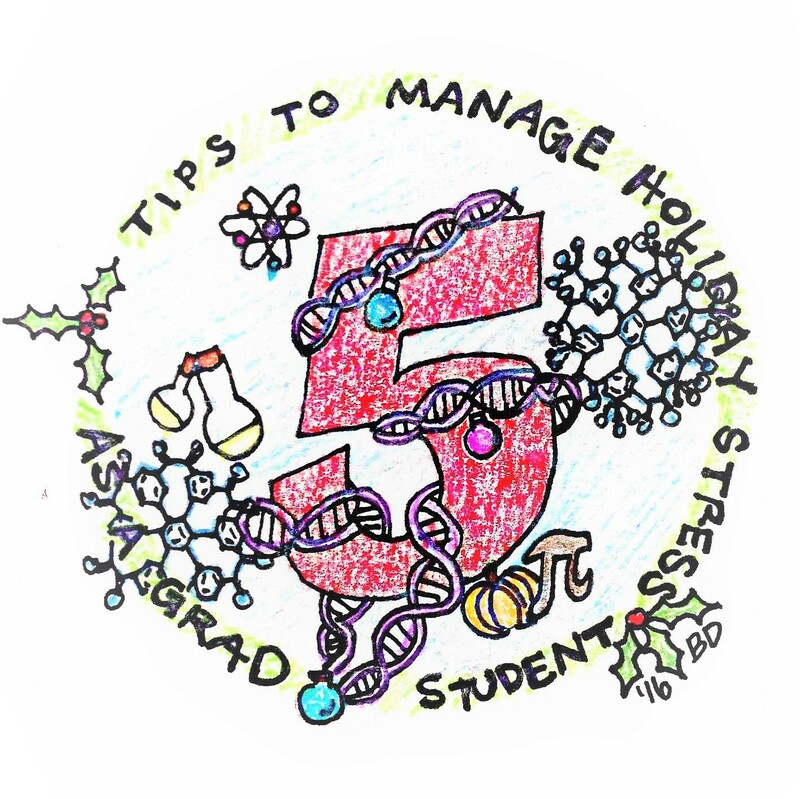 Start by identifying your top stressors going into the holiday season, then check out these tips below. If they resonate with you, think how you can work this advice (as actions) into your upcoming schedule. Don’t forget – prioritizing– is a great form of self-care! Keep a running list of gift ideas in a journal or document on your computer. Not only will holiday shopping be less stressful, but the gifts will be more meaningful. These are gifts you think up during a random conversation or web surfing session. Gift ideas sparked by the intended recipient will be more meaningful or useful to that person. The thoughtfulness behind gifts speaks more than a pricey gift tag ever could. After all, who needs another ‘thing’ that just takes up space? Bestow your loved ones with a handmade gift. A study looking at machine- versus hand-made products found that consumers associate “more love” with handmade items. If you’ve been wanting to learn to knit or crochet, I bet your mom would love a potholder or scarf handmade by you. Lastly, put yourself in your gift recipient’s shoes. When you’re debating between a flashier gift and a more practical one, a study shows that the gift recipient almost always prefers the practical option. For example, let’s say you want to get your sister a pendant necklace, but you’re worried it’s “not enough”. If she got that gift for you, how would you feel? Let down? Or so happy you got a pretty bauble that is totally your taste and shows that your sister knows you so well? Don’t forget about gift cards to food shops and cafes you know your friend frequents often. Alleviate their financial stress with food and caffeine! Travel by bus, train, car, or plane gets expensive – a difficult challenge for grad students and young academics. Wherever you’re planning to travel , consider the cost of travel, the time spent in that location and activities, whose feelings will be hurt if you don’t go, and other considerations specific to your situation. If you’re feeling really ambitious, you can plug it into your handy-dandy decision maximizing functional equation. Remember that Google Hangouts video, Skype, Facetime, and numerous other video platforms mean you can still see the dog’s new Christmas sweater and toast the New Year at midnight. Try unplugging to connect with your family. Research showed that “technoference”, or the interference of technology into our leisure time, can negatively affect our relationships. Try board games for some quality time together. For the not-so-PC family, try Cards against Humanity. You’ll learn a lot about Aunt Jo’s sense of humor (maybe more than you wanted to). For the card-deck family, embark on a Gin Rummy marathon, or take up Canasta (personal favorite). For one-on-one time, try backgammon, chess, checkers, or Mancala. Classics like these never go out of style. If dreary weather gets you down, be proactive and take some steps to improve your self-care routine. Try journaling to relieve anxiety and “empty your brain” before you hit the hay. Meditation can help you recharge when you’re feeling aimless and exhausted. In one study, researchers looked at the effect of mindfulness meditation on brain activity using neuroimaging technology. Make time in your week for a workout class where you can forget about the day for an hour and socialize with other upbeat cheerful people. Or blast through quick 10-minute exercise circuits to rev up your heart rate and release those endorphins we all seek. A lot of social time is spent around food. The holidays are no exception. Holiday weight gain comes down to a) eating more and b) exercising less. Both of these can be combatted by implementing a strategy. A prospective study examining “holiday weight gain” found that those who increased their physical activity during a six-week holiday period gained significantly less weight than those who did not change their activity habits. For example, getting outside for a walk with pets or for a family game of football will keep you away from the holiday food while giving you a chance to get some exercise. For an open-minded family, you can offer to whip up some healthier alternatives to the typical rich holiday foods like these 10 healthy thanksgiving sides. Crustless pumpkin pie with almond milk makes a low-fat custard that satisfies any sweet tooth, and your family won’t believe you when you tell them these low-carb mashed “potatoes” are really cauliflower. Whether you’re staying near or traveling far, remember to enjoy the time with your loved ones and take care of your mind and body to return refreshed for a sunny Spring semester. Peer edited by Nicole Baker.